This simple game for the ATtiny85 is a maze that you navigate with four pushbuttons. The available paths in each direction are shown by four LEDs. A lit LED means that your way is blocked by a wall, and a speaker beeps if you try to move in that direction. When you get to the goal a tune confirms you've succeeded! The Secret Maze game based on an ATtiny85; your only option is to move left. The project is a good example of what you can achieve with the diminuitive ATtiny85; as well as mapping the maze it's driving four LEDs, reading four pushbuttons, and playing tones through a speaker! For a printed circuit board for this project see Secret Maze PCB. The maze is designed on a 16x16 grid, and is represented in the program as an array of 16-bit numbers, with a '1' bit representing a wall and a '0' bit representing a passageway. The maze given in the program listing linked at the end of the article is larger (16 x 16) and much trickier. It's designed so you can't solve it using the trick of following the left-hand (or right-hand) wall, and it includes several traps to lure you into a loop. Even so, if you saw a printed representation of the maze it would be quite easy to solve visually, so to avoid revealing the maze I've given the definition in hexadecimal in the program. Navigating the maze using the four-LED interface makes it challenging, and unless you've got a very good visual memory you'll probably need to draw a map on a piece of paper as you traverse it. The ATtiny85 provides five I/O lines. One of these was needed for the piezo speaker, leaving four available to control four LEDs and read four pushbuttons. The solution is to use charlieplexing, a method of driving LEDs that takes advantage of the fact that each I/O line can have one of three states: low, high, or high-impedance when defined as an input. All the I/O lines are defined as inputs when no LEDs are illuminated, and to light one LED you take one I/O line low and another I/O line high. The LED at the intersection of those two lines will then light up. So the total number of LEDs you can control with four I/O lines is 12. Instead of an LED you can put a pushbutton in series with a diode into any cell (see Postscript). To test the state of the pushbutton you take one I/O line low, make the other I/O line an input with a pullup, and read its state. So you can control any combination of any mixture of 12 LEDs and pushbuttons. Circuit of the Secret Maze game, based on an ATtiny85. It's made a bit more complicated by the wiring needed for the charlieplexing. The pushbuttons are 6mm square tactile buttons, available from SparkFun  or Proto-PIC in the UK . The diodes are 1N4148 small-signal diodes, but almost any diodes should be suitable. For the LEDs I used 5mm clear green LEDs, but again any LEDs should be suitable. The speaker is a miniature piezo transducer. I managed to squeeze all the components onto a mini breadboard; these are available from SparkFun  or HobbyTronics in the UK . The program uses the routine note() to play a note to the piezo speaker on I/O pin 4. This is from my article Playing Notes on the ATtiny85. This routine takes care to avoid changing the Output bit, used for the speaker. Call Look() to display the current position on the lights. Wait until the keys have been released. Check whether we've reached the goal, and if so, play a tune. Check Buttons and wait for a keypress, including key debouncing. Set the variables dx and dy to the direction corresponding to the keypress. Check whether the move is valid, by calling Bit(). If the destination is blocked call Beep() to play a tone. Otherwise update X and Y to make the move. I compiled the program using Spence Konde's ATTiny Core . Choose the ATtiny25/45/85 option under the ATtinyCore heading on the Board menu. Then choose Timer 1 Clock: CPU, B.O.D. Disabled, ATtiny85, 1 MHz (internal) from the subsequent menus. If necessary choose Burn Bootloader to set the fuses appropriately. Then upload the program using ISP (in-system programming); I used Sparkfun's Tiny AVR Programmer Board; see ATtiny-Based Beginner's Kit. Here's the whole Secret Maze program: Secret Maze Program. With a bit more programming you could make the game generate a new random maze automatically when you solved the previous one. Another option would be to provide a breadcrumb-trail button that would allow you to drop breadcrumbs to help you see where you have already been in the maze. These would be indicated by a fifth LED. To make the mazes harder you could allow some of the walls to be directional, so you could pass through one way, but not get back the other way. This could be achieved by using two bits, rather than one, to define each cell. Why are the diodes needed in series with each pushbutton? The answer is to protect against the user pressing two pushbuttons at once when an LED is illuminated. For example, consider the case when the LED between PB0 and PB3 is illuminated. PB0 is at 0V and PB3 is at VCC. Now suppose the user holds down the pushbutton between PB3 and PB1, and the pushbutton between PB1 and PB0. Without the diodes this would short between 0V to VCC. 14th March 2018: The note routine in the first version of the program could sometimes leave the output to the piezo speaker at a high level, which caused a perceptible background buzzing from the speaker. I've updated the program to define the output to the speaker as an input when no note is being produced, which fixes this. ^ Mini Push Button Switch (Pack of 10) on Proto-PIC. 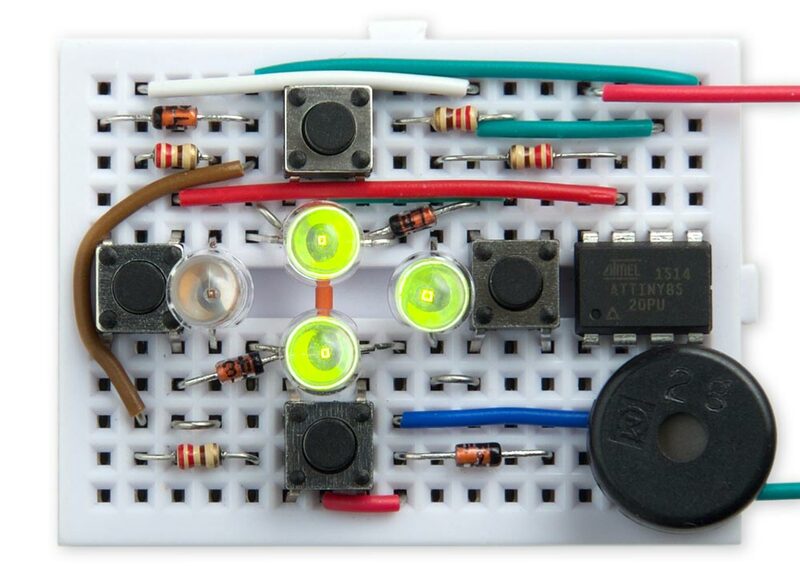 ^ Breadboard - Mini Modular on SparkFun. ^ Mini Breadboard on HobbyTronics.